Tilapia is a great choice when you’re looking for a quick and easy (healthy too!) meal. With just 8 simple ingredients (including the fish), you can have this dish on your dinner table in less than 30 minutes! For a healthier alternative, use low sodium soy sauce in place of the regular soy sauce and oyster sauce if you want to cut back on sodium. I buy my tilapia frozen. They come about 16 small filets to a bag, with each filet individually wrapped. 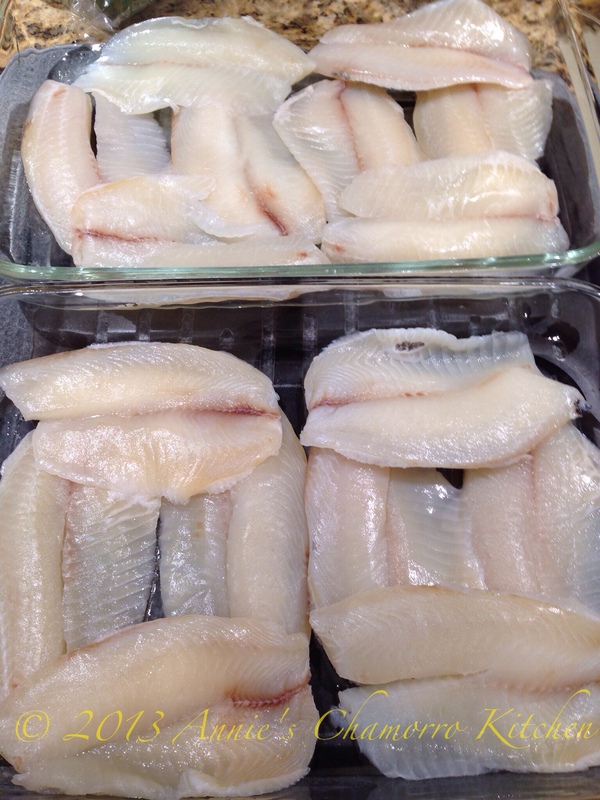 If you buy the fish frozen like I do, thaw them out, then remove each filet from the wrapping. 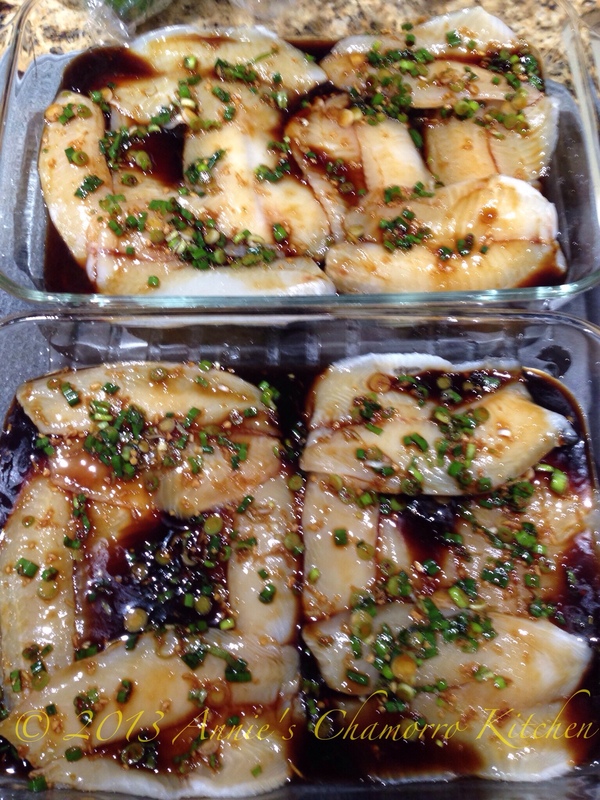 Rinse the filets then place them in a shallow baking dish. I use two 9×13″ baking pans, placing 8 filets in each one. It’s okay of the filets overlap a bit. 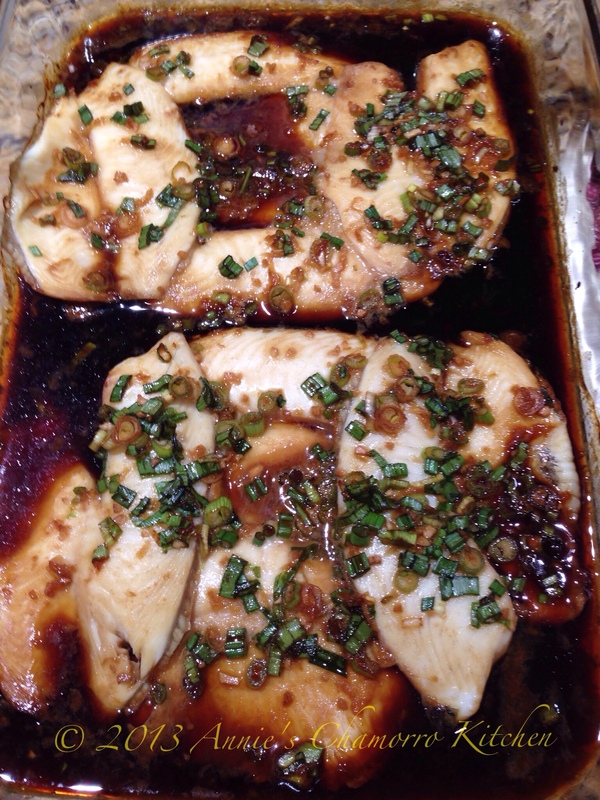 Now that you’ve prepared the fish, make the soy-ginger sauce. 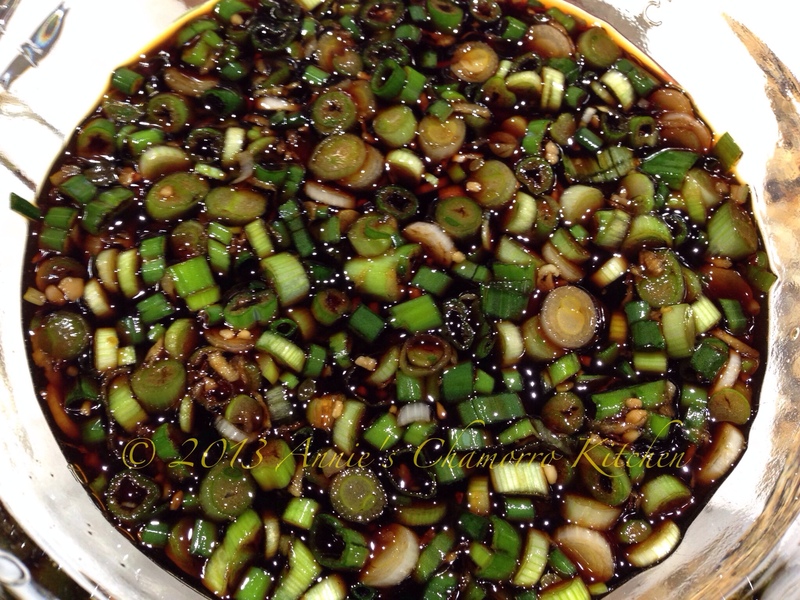 It’s also a good time to preheat your oven to 375 degrees F.
In a small microwave-safe mixing bowl, combine the soy sauce, red wine vinegar, oyster sauce, honey, garlic, and ginger. 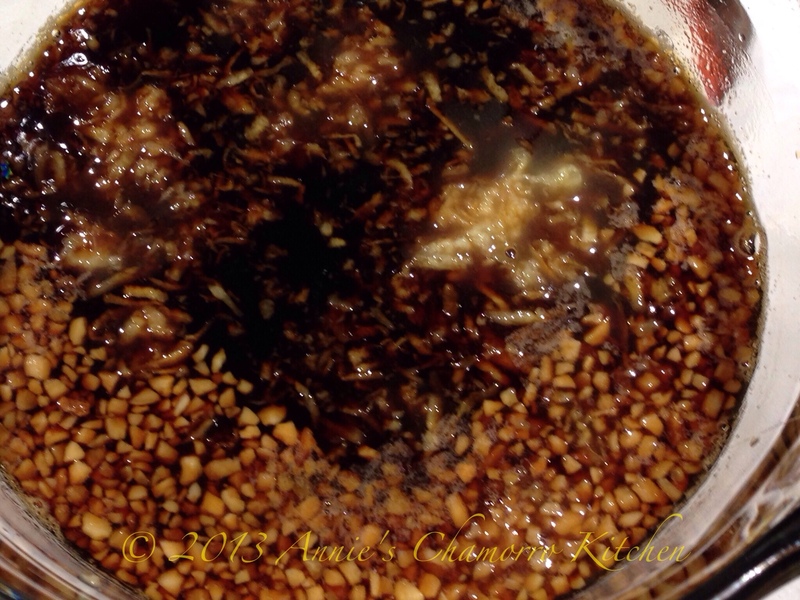 Microwave the mixture for one minute — you want to heat the mixture so that you can easily dissolve the honey. After heating, stir with a fork to combine all the ingredients. Add the green onions; stir to combine. Bake the fish at 375 degrees F. for 12 to 15 minutes. This fish cooks fast, so check for doneness at the 12-minute mark. 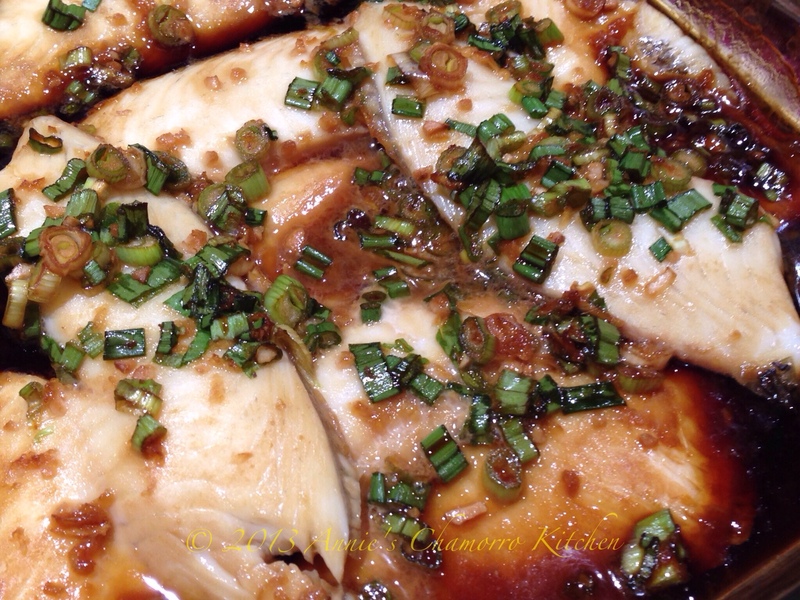 The fish is white, and flakes easily with a fork when done. 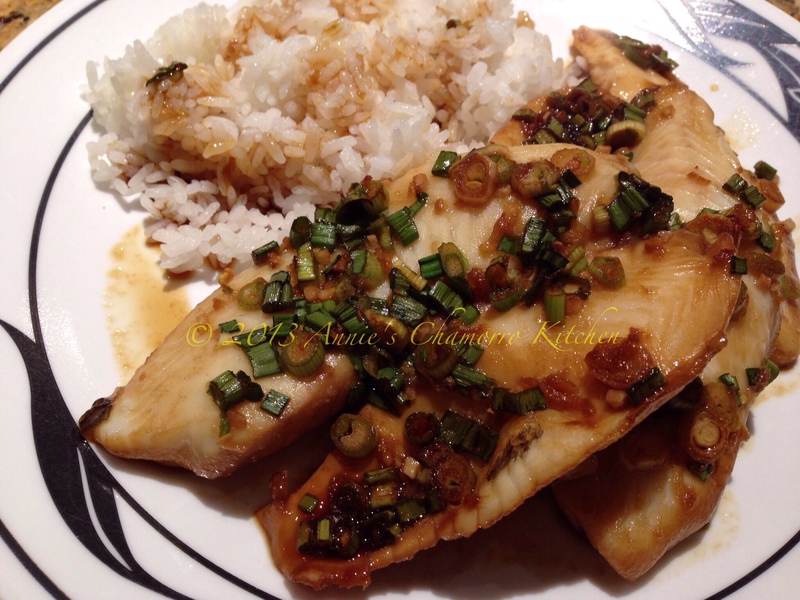 Serve with hot white rice, and don’t forget to pour some of the delicious soy-ginger sauce over the rice too! Hot danged, the dishes shown here on Annie’s Kitchen all look absolutely delish and inviting – doesn’t matter (am partial to fish, especially tilapia, however, never dressed up like that, makes my mouth water). Listen, been meaning to ask this/just curious – where’re you guys located – and who’s “Annie” from Annie’s Kitchen? Are you formerly from Guam – from the “Merfalen-Guevara” family?. How ’bout a small bio from you; we’re interested!! Wonderful website – very colorful – love it. Hi Rose! I’m in Colorado, and yes, I’m a Merfalen. The Merfalen-Guevara family are my relatives.